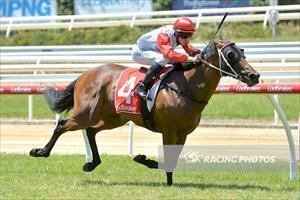 Three runners for the stable at Ballarat on Wednesday including the debutant, Parsifal. Parsifal is a three-year-old brother to our own Lord Barrington and the son of Darci Brahma has shown he can gallop. Mike Moroney is looking forward to getting Parsifal started. “He has shown in his work he has good ability and his jumpouts have been good,” Moroney said. “He is still very green and new and is also a horse that is very lazy and needs to be made to do it. Little Rock is the first to go in race two, the Fillies & Mares Maiden Plate over 1100m where she has drawn barrier four and will be ridden by Patrick Moloney. Moroney has added blinkers to the daughter of Fastnet Rock and feels they will assist. “She trialled well with them on at her last jump out and has worked impressively in them,” Moroney said. "She has shown us nice ability at home and even though she is first-up I’m expecting her to run well. Bolek (pictured) runs in race seven, the Class 1 Handicap over 1200m where scratchings have reduced the field to eight. The three-year-old son of Swift Alliance won his Maiden impressively at Mornington last start and has pleased Moroney since. “Bolek has done extremely well since his excellent win and had a jump out in between where he went terrific,” Moroney said. “The way the field has cut up I feel he will run a big race and be hard to beat.